We waited for the Meltemi to die down at the end of August before heading East through Corinth toward Turkey. We thought we might be running a bit late in the season, but this worked out well. Without the Meltemi, and without the throngs of tourists, September is lovely time in the Aegean. In 2006, we found that the weather in Turkey was great for cruising, right into November, so there really is no need to rush through the Aegean. I have not visited Crete yet, but these are notes that I gathered for a proposed trip in spring of 2007. Non-EU boats can stay in the EU 18 months before being subject to import duty. It is unclear how long the boat should remain outside the EU before re-entering; some suggest 1 hour in international waters, while others believe that you need to stay out 6 of 24 months. Some Greek authorities have been known to enforce these regulations. The Shengen treaty might be more of a problem in Greece. Non EU residents are allowed to remain in the EU no longer than 3 months. You then need to travel to a non-Shengen country for a few hours and return for another 3 months. A flight or ferry to Tunisia, Croatia or Turkey will reset the clock provided you get a clear stamp in your passport showing that you have left the Shengen area. Note that some non-EU countries like Switzerland are still part on the Shengen treaty.. If you are going to try the international waters scenario, you need to check out of the EU as if heading for a non EU country and get an exit stamp in your passport. Make sure your log book is clearly updated showing your passage into international waters before you return. It might help to photograph your GPS showing your position and the date. Of course they may not believe the photo as it could have been doctored with photoshop. A friend was fined €1100 when leaving Greece for Turkey because he had been in the EU more than 3 months. If you stay in Greece, or if you plan to stay or leave the boat longer than 3 months, you are liable for cruising tax which, I was told, could be as much as €300 for a 12 meter boat (actually it is only €14.67 x 12 meters= €176.04 for three months) so might be advisable to travel elsewhere when you get close to your 3 month deadline. The cruising tax could be an issue for boats considering wintering in Greece. Before a yard will haul the boat you will need to go to the port authorities who will charge you the tax up front, for the time you plan to stay in Greece. This regulation is being challenged by cruisers who feel that it is not compliant with EU regulations. Others have pointed out the low cost of cruising in Greece, paying little or nothing at city docks and suggested that the cruising tax is a small price to pay for the privilege of cruising in this magnificent paradise. There is a lot of truth in the expression 'It is all Greek to me', but I found it helps a lot when one can actually sound out the words. 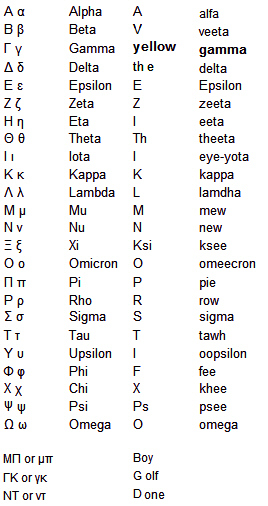 Once you have a grasp of how the greek alphabet is pronounced, written words suddenly take on some meaning and they are even sometimes quite similar to English since we got quite a lot of our vocabulary from Greek. olive oil, garlic, vegetables, herbs, tomato, onion, oregano, dill, bay leaves, basil, thyme, fennel, potato, beans, peppers, okra, onions, grains, bread, wine, retsina, ouzo, fish, octopus, poultry, rabbit, lamb , pork, olives, feta cheese, eggplant, zucchini, spinach, grape leaves, yoghurt, nuts, honey, phyllo pastry, cinamon, cloves, metaxa. Saganaki: a special fried cheese. Tzatziki: Yoghurt cucumber, garlic dip or spread served with bread. As an update, we finally found stores selling just the 10 day scratch cards but still for €19. So you do not need to change the SIM card but just enter the scratch card number on the website to top up for another 10 days. €49 for USB stick +10 days internet. €19 for each additional 10 days. The only option for G3 and GPRS intenet coverage,that we could find was Vodafone Mobile Broadband on Demand, which worked fine in most areas, but quite expensive. The USB stick with the SIM card cost €49 and included 10 days of internet coverage. 24 hour coverage for 10 consecutive days with a cap of 10GB which would be hard to reach at 3G and GPRS speeds. You need to take your passport to the Vodafone store, and if you want to start the service immediately, you may want to take your laptop too. We bought the stick and card in Corfu town, buit did not activate it until some days later, as we were up to date on internet and email. You need to insert the SIM card provided in the box into the little slot at the PC end of the stick, which may be difficult to find at first. To activate the stick, you simply insert it into the laptop, and go through the installation process. It worked fine on my Windows 7 netbook, despite the store owners doubts. When the installation is completed, it will take you to a Vodafone website, and this is where we got stuck, as we could see no place to enter the 10 day scratch card number on the webpage. Luckily, one of our cellphones was Vodafone, so I just called the customer service number, and they explained that the scratch card number location is at the bottom of the first page you come to. I think you had to click on "Continue to Service" or something like that, then there was a field to put in the scratch card number provided with the stick. This gives you 10 consecutive days of internet, after which it gets quite silly, and we bought a few 2 hour cards for €3.50 for emergency use. Now this is 2 consecutive hours, so if you start it at midday, it finished at 2pm regardless of how much you used the internet in that time. You cannot log off and expect to be able to log back on later. Hopefully the Greeks will eventually catch up with the rest of the world and provide a reasonably priced continuous prepaid service. But there is a way around this, if somewhat clumsy. You can buy just the SIM card without the USB stick for €19 which also includes 10 days of internet. So even though it is still quite expensive, if internet is important to you, then buy additional SIM card packages with 10 day access for €19. When your first 10 days runs out, you simply install the new sim card, and enter the new scratch card on the website and you are good for the next 10 days. They will try and sell you a contract, which is much more reasonably priced, at €30 per month (as opposed to €54 with the prepaid method, but you need an address in Greece, and you will need to cancel at the end of the summer or your credit card will continue to be charged. We though it safer to go with the prepaid. We have just bought our second SIM card for €19 in Argostoli, and when our first card runs out in a few days, we will wait a few days before activating the new card, and thus, stretch out the cost a little. The GPRS is painfully slow, but served the purpose in some lesser populated areas for email and weather. The 3G which sets up automatically when available, is quite respectably fast. The USB has a solid green light when in GPRS and a solid blue light on 3G. 3G is available in all major tourist ports and the surrounding bays, and only in unihabited areas like south of Ithaca town did we have no coverage. If you already have a USB Vodafone stick, it may, or may not be locked to the previous provider. Take it along to the store with you and they can check it out. If it works, you can just buy the €19 sim card and not the €49 stick. We found 2 vodafone stores in Corfu town, close to the bus stop. They only have them in larger cities. Here is a link to a store locator.